An international team of astronomers have discovered an unusual laser emission that suggests the presence of a double star system hidden at the heart of the "spectacular" Ant Nebula. The extremely rare phenomenon is connected to the death of a star and was discovered in observations made by European Space Agency's (ESA) Herschel space observatory. When low- to middleweight stars like our Sun approach the end of their lives they eventually become dense, white dwarf stars. In the process, they cast off their outer layers of gas and dust into space, creating a kaleidoscope of intricate patterns known as a planetary nebula. Our Sun is expected to one day form such a planetary nebula. A nebula is an interstellar cloud of dust, hydrogen, helium and other ionized gases. The Ant Nebula earns its nickname from the twin lobes that resemble the head and body of an ant. The recent Herschel observations have shown that the dramatic demise of the central star in the core of the Ant Nebula is even more theatrical than implied by its colourful appearance in visible images – such as those taken by the NASA/ESA Hubble Space Telescope. 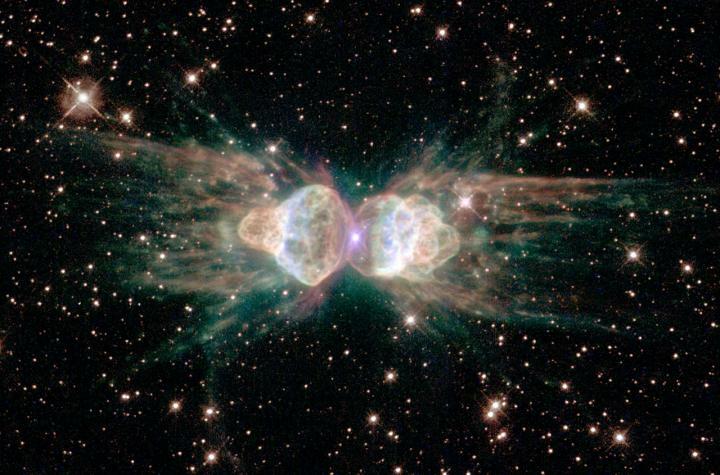 The new data shows that the Ant Nebula also beams intense laser emission from its core. Lasers are well-known down on earth in everyday life, from special visual effects in music concerts to health care and communications. In space, laser emission is detected at very different wavelengths and only under certain conditions. Only a few of these infrared space lasers are known. By coincidence, astronomer Donald Menzel who first observed and classified this particular planetary nebula in the 1920s (it is officially known as Menzel 3 after him) was also one of the first to suggest that in certain conditions natural 'light amplification by stimulated emission of radiation' – from which the acronym 'laser' derives – could occur in nebulae in space. This was well before the discovery of lasers in laboratories. Dr Isabel Aleman, lead author of a paper describing the new results, said "We detected a very rare type of emission called hydrogen recombination laser emission, which is only produced in a narrow range of physical conditions. "Such emission has only been identified in a handful of objects before and it is a happy coincidence that we detected the kind of emission that Menzel suggested, in one of the planetary nebulae that he discovered." This kind of laser emission needs very dense gas close to the star. Comparison of the observations with models found that the density of the gas emitting the lasers is around ten thousand times denser than the gas seen in typical planetary nebulae and in the lobes of the Ant Nebula itself. Normally, the region close to the dead star – close in this case being about the distance of Saturn from the Sun – is quite empty, because its material is ejected outwards. Any lingering gas would soon fall back onto it. Co-author Prof Albert Zijlstra, from the Jodrell Bank Centre for Astrophysics at University of Manchester, added: "The only way to keep such dense gas close to the star is if it is orbiting around it in a disc. In this nebula, we have actually observed a dense disc in the very centre that is seen approximately edge-on. This orientation helps to amplify the laser signal. "The disc suggests there is a binary companion, because it is hard to get the ejected gas to go into orbit unless a companion star deflects it in the right direction. The laser gives us a unique way to probe the disc around the dying star, deep inside the planetary nebula." Astronomers have not yet seen the expected second star, hidden in the heart of the Ant nebula. Göran Pilbratt, ESA's Herschel project scientist, added: "It is a nice conclusion that it took the Herschel mission to connect together Menzel's two discoveries from almost a century ago." The paper's publication coincides with the first UNESCO International Day of Light, and celebrates the anniversary of the first successful operation of the laser in 1960 by physicist and engineer, Theodore Maiman. "Herschel Planetary Nebula Survey (HerPlaNS): Hydrogen Recombination Laser Lines in Mz 3" by I. Aleman et al is accepted for publication in Monthly Notices of the Royal Astronomical Society. University of Sao Paulo, Brazil/Leiden Observatory, The Netherlands? Long: The Ant Nebula, as imaged by the NASA/ESA Hubble Space Telescope, resembles the head and body of a garden ant. In reality, it's the result of a dying Sun-like star and complex interactions of material at its heart. The University is also one of the country's major research institutions, rated fifth in the UK in terms of 'research power' (REF 2014). World-class research is carried out across a diverse range of fields including cancer, advanced materials, addressing global inequalities, energy and industrial biotechnology.